BEIRUT (AP) — Jamal Khashoggi, the Saudi journalist who disappeared last week after a visit to his country’s consulate in Turkey, was a Saudi insider. He was a close aide to the kingdom’s former spy chief and a leading voice in the country’s prominent dailies, including the main English newspapers. He interviewed Osama bin Laden in Afghanistan before al-Qaida was formed, then met him in Sudan in 1995. Following bin Laden’s rise likely helped cement Khashoggi’s ties with the powerful former Saudi spy chief, Turki Al-Faisal. Khashoggi rubbed shoulders with the Saudi royal family and supported efforts to nudge the kingdom’s entrenched ultra-conservative clerics to accept reforms. He served as an editor for nine years on the Islamist-leaning al-Madina newspaper and was frequently quoted in the Western media as an expert on Islamic radicals and a reformist voice. Khoshaggi then served as media adviser to Al-Faisal, the former spy chief who was at the time the ambassador to the United States. Khashoggi returned to Al-Watan in 2007 where he continued his criticism of the clerics as the late King Abdullah implemented cautious reforms to try to shake their hold. Three years later, he was forced to resign again after a series of articles criticizing Salafism, the ultra-conservative Sunni Islam movement from which Wahhabism stems. In 2010, Saudi billionaire Alwaleed bin Talal tapped him to lead his new TV station, touted as a rival to Qatari-funded Al-Jazeera, a staunch critic of the kingdom. But the new Al-Arab station, based in Bahrain, was shut down hours after it launched in 2015 for hosting a Bahraini opposition figure. ‘‘This was a critical period in Arab history. I had to take a position. The Arab world had waited for this moment of freedom for a thousand years,’’ Khashoggi told a Turkey-based Syrian opposition television station, just days before he disappeared. He also criticized his government’s diplomatic break with Qatar and war on Yemen as well as Riyadh’s policy toward its archenemy, Iran, whose influence has grown in neighboring Yemen and in Syria. In the Sept. 23 interview, he called Saudi Arabia’s foreign policy ‘‘narrow minded,’’ and ridiculed its crackdown on political Islam, urging the kingdom to realign its policy to partner with Turkey, a close Qatar ally. Before his disappearance, Khoshaggi had been living since last year in the U.S. in a self-imposed exile, after he fled the kingdom amid a crackdown on intellectuals and activists who criticized policies of Crown Prince Mohammed Bin Salman. ‘‘As of now, I would say Mohammed bin Salman is acting like Putin. 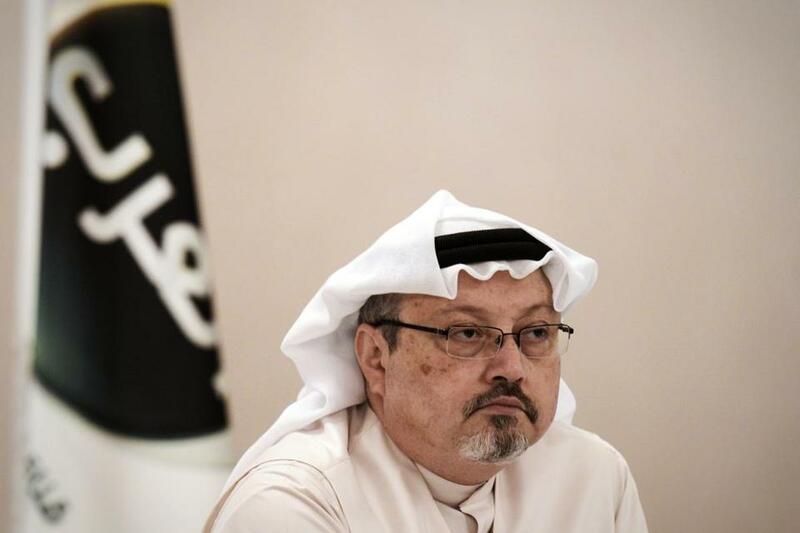 He is imposing very selective justice,’’ Khashoggi wrote in the Post last year after he fled the kingdom, saying he feared returning home. He described ‘‘dramatic’’ scenes of arrest of government critics accused of receiving Qatari funding. They included a friend of Khashoggi who was had just returned from a trip to the U.S. as part of an official Saudi delegation. ‘‘That is how breathtakingly fast you can fall out of favor with Saudi Arabia,’’ he wrote.